This revolutionary product applies the proven principles of heat, pressure and massage to detoxify the skin by removing toxins, fluids and ultimately fat for less than the cost of a single session at a beauty salon/spa. The beauty of this Italian garment is that it is proven effective and completely natural in the way that it works. It even contains silver ions that make it anti-bacterial and hypoallergenic. Consider Lipo Contour Elite as your own personal sauna and massage therapist, that will help get rid of unwanted cellulite around your, hips, thighs and stomach effortlessly and naturally. The secret behind the effectiveness of the garment is based on how three special fabrics work together to fight cellulite. Each layer applies a specific function. The patented Elite 3D Wave is the key ingredient in this fat-fighting garment. This three dimensional fabric is made up of tiny waves of folded material arranged in a manner to maximise the mechanical stimulation (massage action) onto the skins surface. The gentle yet constant massage increases the microcirculation of blood in the skin’s sub-surface. Increased blood microcirculation helps to reduce adipose tissue (fat) and aggregations (lumps) in addition to improving the oxygenation of the skin and its appearance. This inner layer also contains embedded silver ions, providing anti-bacterial and hypoallergenic properties. Made from Neoprene the fabric used to manufacture high quality scuba suits; this fabric creates the thermal action by reflecting the body’s own heat back to the skin’s surface. The firm and constant pressure of the outer most layer, keeps both the inner and middle layer firmly against the skin, actively working to stimulate the release of toxins, fluids and ultimately fat. 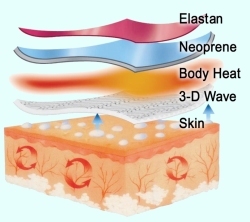 These three specially designed layers of fabric are required to achieve the three functions of massage, heat and pressure. Working together, they increase fatty acid catabolism (the breakdown of fat molecules), whilst stimulating blood supply. This bio-stimulation improves lymphatic drainage, reduces inflammation and ultimately improves the oxygenation of the skin. The results are smooth, firm healthy skin. The effectiveness of Lipo Contour Elite has been scientifically tested through a large-scale study of 96 women over a period of eight weeks at the Dermatological Clinic at the University of Chieti, Italy. The study concluded: improved drainage, increased oxygenation of the skin and fat tissue and a significant reduction in the appearance of cellulite. They also confirmed that the garments were effective in reducing the thickness of fat around the buttocks, thighs and lower back and stomach. With circumference reduction of between 6% – 13% in 4 weeks and up to 21% in 8 weeks across the different body parts. Scientific tests prove the patented mini wave fabric of Lipo Contour Elite, stimulates the skin to release toxins, fluids and fat in just 4-8 weeks. The beauty of this Italian garment is that it is proven effective and completely natural in the way that it works. Lipo Contour Elite starts to work immediately, most women experience softer, smoother skin in just 7 days. The maximum effect is achieved after only 8 weeks of use. One of the considerations in the development of this garment has been the easy of use. Simply wear Lipo Contour Elite as you would your other clothes. Lipo Contour Elite has been designed by the Italians to look and feel good, it’s hard to believe that this garment can effectively reduce or eliminate cellulite but that’s exactly what it does. The garment is most effective if worn at least 4 hours a day for a period of 8 weeks while doing activities that involve the use of muscles in your legs, buttocks, and abdominal areas to generate heat and movement. It can be worn while doing normal household activities such as gardening, cleaning, cooking and laundry. Wearing the garment while doing more strenuous activities, such as walking and exercising, will activate cellulite loss even faster. Lipo Contour Elite is available in 5 sizes (10,12,14,16 & 18). Colour available is Black. Washing instructions: Hand wash at low temperature, with a small amount of mild detergent. Dry naturally away from direct heat. Do not dry clean. Caution: If you suffer from severe varicose vein issues, leg inflammation or ulceration, or suffer with any other medical complaint to which the product could be restrictive, please consult your GP prior to use. Do not wear this garment if you are pregnant (for obvious reasons).